The Alive & Thrive (A&T) Talking Babies Media Campaign, which ran in Viet Nam from 2011-2014, was designed to encourage mothers to practice exclusive breastfeeding (EBF). The campaign employed innovative TV spots featuring "talking babies" who encouraged their moms to feed them only breastmilk for the first six months of their lives. Research studies conducted in 2009 had concluded that only about 20% of Vietnamese mothers practiced the ideal behavior—giving breastmilk and only breastmilk for the first six months. As a result, A&T embarked on a program to improve EBF practices in Viet Nam—through advocacy, interpersonal communication, and community mobilization—at a scale large enough to have an impact on national rates. In a little over three years, the prevalence of exclusive breastfeeding nearly tripled in areas where the program initiated high quality interpersonal counseling and support for breastfeeding provided through a franchise and support group model. When mass media was added to the mix, exclusive breastfeeding increased from 18-28 percent during the same period. The campaign also employed an innovative social franchise model component. The social franchise model helps to standardize counseling services for caregivers at health care facilities and to monitor quality of services. This Spotlight follows the development of the mass media activities. The social franchise model activities will be covered in a forthcoming Spotlight. Through a series of consultations on the ground in Viet Nam, A&T learned about opportunities to contribute to breastfeeding efforts. The team hired Ogilvy & Mather (O&M) to conduct a media audit which contributed to an understanding of the media landscape in Viet Nam and the role of mass media in marketing feeding practices and infant formula. The audit also identified and evaluated current marketing messages, materials, and media outlets with respect to feeding practices, infant formula, and other nutrition products. The pillars of the program (illustrated in the strategy diagram below) were identified at the outset—advocacy, interpersonal communication, mass communication, and strategic use of data. The formative research and other studies enabled the team to help inform these pillars and develop appropriate strategies. 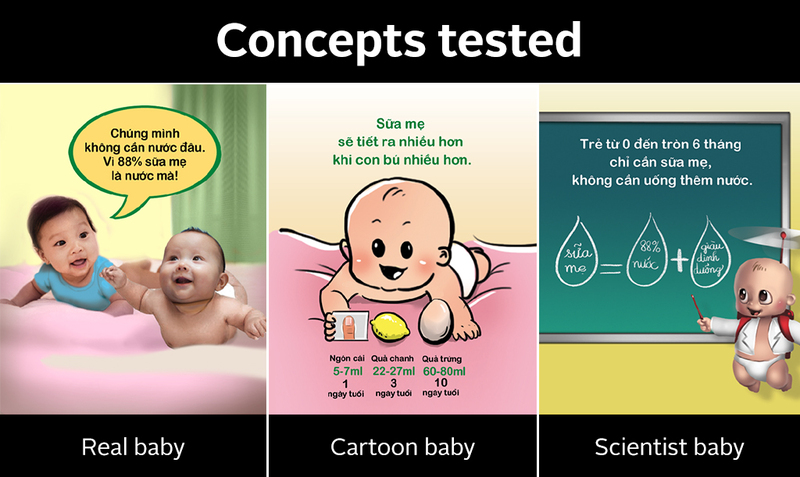 From the formative data and other studies, the team was able to identify the biggest threats to EBF—the practice of giving babies water to quench their thirst or clean their mouths, and the perception (held by mothers, family members, and even doctors) that Vietnamese mothers are not able to produce enough good quality milk for their babies. Consequently mothers and caregivers alike, including health workers, had come to believe that a combination of breast milk and infant formula was the best nutrition for an infant. These findings helped to shape the interpersonal communication activities and the mass media campaign. In 2010, A&T initiated early concept testing. A private sector cross-cultural marketing firm based in the US, interested in contributing to the campaign, offered pro bono market research designed to help A&T develop models to address the important issues in the mass media campaign. Rounds two and three of the concept testing, as well as the pretesting of the actual materials, took place in 2011. For round two of concept testing, A&T hired Indochina Research to test concepts in 32 focus groups in order to guide decisions about messages, characters, storylines, visuals, and formats. Results showed that participants preferred to hear scientific evidence to support any claims about breastfeeding. A&T tested the concepts with mothers of young babies, grandmothers, and health workers. 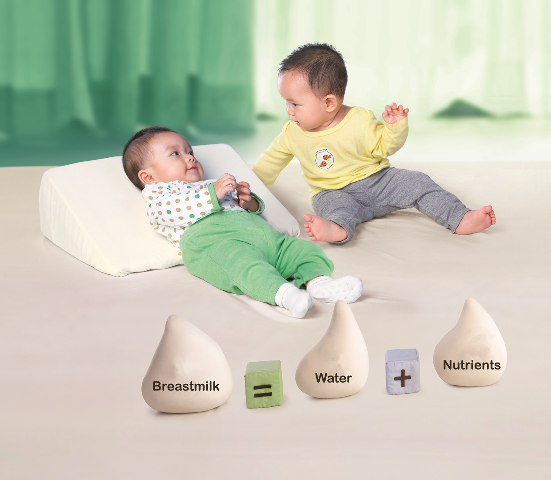 Using babies as an emotional hook to promote breastmilk (concept 2) was seen by the audience as the most appealing and trustworthy. For round three of concept testing, three visuals of different types of babies (animated and live) were shown to 36 focus groups to find out which was most appealing and whether the call-to-action was clear. Results of this round revealed that mothers, caregivers and health workers liked the concept of babies talking to their mothers about the best nutrition for them. This was exciting to the team, even though the production challenges were a bit daunting. It was a challenge to produce two TV spots with infants—a six month old and a four month old. In addition, the babies needed to be shown "talking" to each other. The shoot itself took two full days, with plenty of breaks in the filming for the baby “stars” to breastfeed, rest, and sleep. The team then auditioned children between three and five years of age to record the babies’ dialogue—one set of voices for the northern part of the country and one for the south, since the accents are different. Then came the difficult task of matching the words to the movement of the babies’ mouths—this was accomplished digitally. The team developed a video documenting the unique expeirence of working with the baby stars. Only the TV spots were aired throughout the entire country, whereas the full mass media campaign was implemented in 15 provinces, where interpersonal counseling on infant and young child feeding was also available, through a social franchise model at government health centers and with mothers’ support groups in remote villages. The full mass media campaign, built around the “talking” babies of the TV spots, included audio messages delivered over outdoor loudspeakers, print ads on the outside of buses, billboards, and posters in health centers. The TV spots were displayed on LCD screens in hospitals, health centers, and supermarkets. Urban mothers benefited from online activities, including a website dedicated to infant and young child feeding, interactive online counseling, interactive mothers’ forum, TV spots placed on Vietnamese websites that are most popular with women, Facebook fan page, and a mobile app to connect young mothers and allow them to track baby’s milestones, share photos, and access information on feeding recommendations. A&T developed a rigorous monitoring process in order to track the program’s implementation and watch for changes in knowledge, beliefs, and practices as the program was underway. The findings enabled the team to adjust the media plan in order to reach the greatest number of people. Additional funding gave A&T the chance to conduct a rigorous evaluation of the mass media campaign. They invited leaders in the field of evaluation of mass media for health, including Dr. Robert Hornik of the Annenberg School for Communication, University of Pennsylvania. Television coverage, especially coverage of national channels, is very high in Viet Nam, making a randomized control trial an unfeasible evaluation approach. To strengthen the case that the TV spots contributed to behavior change, A&T developed a behavior change pathway and inserted a number of questions to measure possible behavioral determinants—in the categories of knowledge, beliefs about outcomes of the behavior, perceptions of social norms, and sense of self-efficacy. The hypothesis was that the mass media messages would have an impact on behavioral determinants which in turn would lead to a change in the desired behavior of exclusive breastfeeding. In July-August 2011 A&T conducted a baseline survey with over 6,000 mothers of children under six months in 11 provinces. They then conducted three rounds of data collection in a sub-set of four provinces and a final endline in 11 provinces in April-May 2014. Experience from the baseline helped the team to refine questions and identify those determinants that were likely to be most predictive of desired practice. Round 1 of data collection helped to refine the behavioral determinant questions further. Each wave of data collection was timed to follow a burst of the TV campaign. For the final wave, the team returned to all 11 provinces in which the baseline had been conducted. The data from the various rounds show that behavior change can happen rapidly. Just a year into the mass media campaign, EBF had risen from 22% to 58% in intensive areas and from 30% to 37% in TV-only areas. 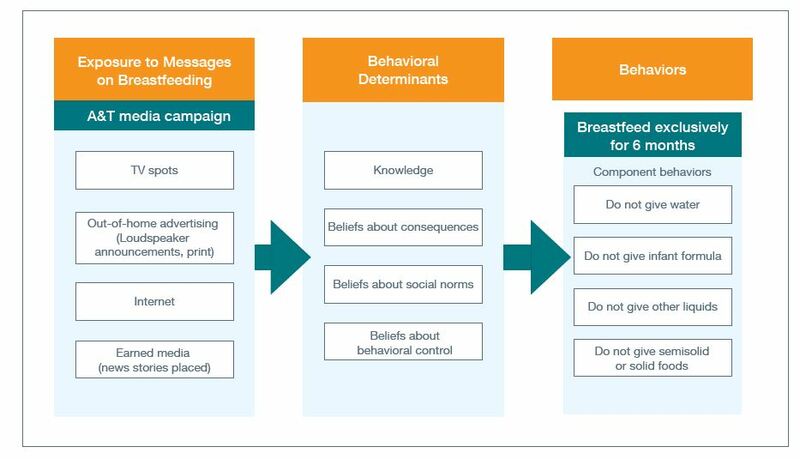 Women who recalled three or more messages from the mass media campaign were significantly more likely to be giving only breastmilk (the behavioral goal). To enable norm formation and sustain behavior change for EBF across new cohorts of babies, sustained and intensive mass media bursts must be maintained over time. During the life of the campaign, more mothers reported being confident that their breastmilk was enough. From the outset, A&T worked closely with the Vietnamese government and local and international partners to develop and implement a comprehensive program to improve infant and young child feeding. This steady attention to partnerships paid off. In 2014, after 5 years of implementation, A&T handed over management of the interpersonal counseling in child feeding to the Vietnamese government, which has committed to sustaining and replicating the network of social franchises and support groups. A&T’s behavior change communication strategy has generated widespread interest in the region with the Cambodian Ministry of Health, for example, adapting A&T's TV spots to advance its national nutrition strategy. A&T has demonstrated that intensive, comprehensive programming—with advocacy, interpersonal communication and community mobilization, mass communication, and strategic use of data—can result in large scale behavior change. A&T's experience in Viet Nam confirms the belief that to reach scale in a timely manner and with impact, an infant and young child feeding program must use the mass media channels available to it. The TV spots reached families throughout the country—and on their own, have the potential to increase many mothers’ EBF behaviors. But the full multimedia campaign included the TV spots, posters, billboards, bus ads, and community loudspeaker announcements. This full media campaign was conducted in the same geographic areas where the interpersonal counseling program was underway. Not surprisingly, A&T saw greater behavior changes in areas with greater intensity. A&T had been advised by Dr. Hornik, an expert in evaluation of mass media campaigns for health, that there was no point in evaluating a campaign unless its intensity was close to the intensity of commercial media campaigns. Negotiating discounts for the media buy, with support from the government, helped to enhance that intensity. It is estimated that formula companies spend $13 million each year on advertising in Viet Nam. A&T spent approximately $5 million over three years. In addition to the media buys to broadcast spots on national and provincial TV stations, they placed the spots on websites that are the most popular with young urban mothers and played them on screens in supermarkets and at health centers. The A&T team learned that the intensity of the media buy was important. As new women become pregnant and are parenting children under 6 months of age, the intended audience is always “fresh” and newly attuned to messages about breastfeeding. The A&T team learned a lot about the behavioral determinants of EBF—and how to track them. For example, they learned from the baseline survey that the perception that EBF for six months is the norm is associated with increased exclusive breastfeeding. And they are able to state that exposure to the campaign's TV spots increased mothers’ perception that exclusive breastfeeding is the social norm. For a number of these behavioral determinants, the evaluation plan allowed them to trace the behavioral pathway: exposure to TV spots changed the belief, and changes in that belief are associated with increased behavior. A US-based marketing firm explored ideas to learn more about mothers’ lack of confidence in their breastmilk and the kinds of “messengers” that would be most persuasive. For round two, a national commercial marketing firm conducted 32 focus groups to test four concepts, in order to guide decisions about messages, characters, storylines, visuals,and formats. For round three, the firm tested the appeal of three portrayals of babies, discovering that “live” talking babies idea was preferred over cartoons. They also checked that the call-to-action was clear. The creative agency, Ogilvy & Mather, developed creative ideas; A.C. Nielsen created storyboards. A&T contracted with Indochina Research to test these with mothers and grandmothers. A&T consulted with experts in evaluation of mass media for health behaviors to develop a rigorous evaluation plan focused on A&T's mass media component. A&T also conducted its baseline in 11 provinces just prior to campaign launch, surveying 6,175 mothers with children under six months of age. A&T worked with a top level commercial agency to produce emotional TV spots and other materials that would “cut through the clutter” of a sophisticated advertising environment. The “Breastmilk Only” and “No Water” TV spots were launched in November 2011. The launch was planned to maximize reach, with a three+ reach of 85% (meaning that 85% of target audience would be reached at least three times). The campaign ran intermittent bursts of three to six weeks each, with breaks of two to 16 weeks. This occurred between November 2011 and May 2014. These were conducted in four of the 11 provinces, using a shorter questionnaire, surveying over 2000 mothers with children under six months. This activity was timed to coincide with the end of a burst of TV advertising. Each wave was with a new cohort of mothers, since the team was interviewing only mothers with children under six months. This was carried out October 2012; April 2013; October 2013. This was conducted in all 11 provinces where the team had conducted baseline, surveying 6,240 mothers with children under six months of age. A&T’s job was ‘proof of concept’: We’ve demonstrated that, with the right resources ... and a strategic approach to behavior change, a large country CAN scale up nutrition and can change breastfeeding practices in five short years.